Charlotte NC (CLT) is the finest airline hub in the eastern US. It offers a sensible gate layout and is in a region that rarely suffers poor weather. 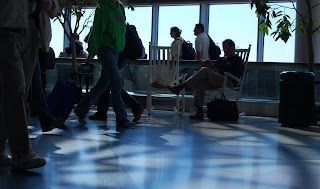 Here, rocking chairs are made available to transiting passengers, in a nod to North Carolina's furniture industry.